Summer fashion means dresses! I don’t have that many, so there are two dresses on my list – No 1 for leisure and No 2 for work (it will be great for winter too). Also, I’m glad that finally there is a print (i.e. tile print which will be big in 2013) that I can wear as florals aren’t really my thing. As for the earrings, bright statement accessories are a great way to style up your look. I’ll be adding 2 pairs of beautiful earrings to the statement necklaces that are already in my jewellery box (this and this). Seriously, how cool are these leopard earrings? 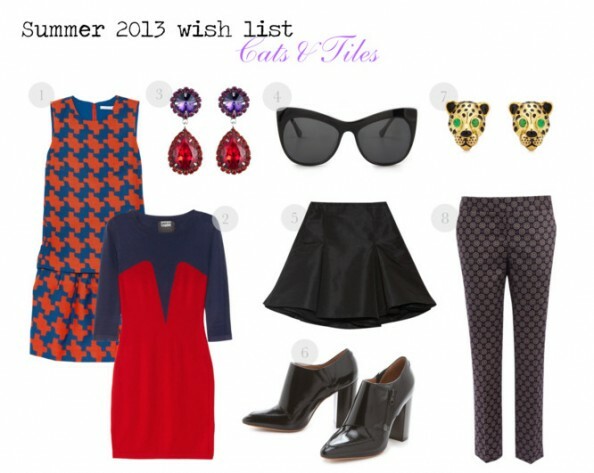 Imagine that black Red Valentino skirt with a simple white blouse, black stilettos and the leopards earrings. Summer, here we come! Love the trousers you choose and I think everyone needs a black a-line skirt like that! Great wish list Maria. I love the tile print and those Phillip Lim boots! I am also on the hunt for a great Summer dress that can take me from day to night. oh wow those leopard earrings are gorgeous! actually I think the bag I wanted is from the same line- Juicy and its green and leopard! Love this boots & sunnies !!! Those leopard earrings are incredible! I am now seriously dying for a pair. Also, the Phillip Lim booties are so great. I want.. All of these things!!! The earrings especially are fantastic! Love a hint of red! those earrings!!! Lovely pieces. I really like the dresses. I love those leopard earrings. They are just gorgeous!